Rajesh Gunani is a serial entrepreneur for the last two decades with interests in real estate, media services. Gunani is the founder of AYS Enterprises Private Limited which has interests in real estates and SRA projects. He is responsible for all business and legal matters related to both the firm’s investment and operating activities. He started his career in 1990 by carrying forward the legacy of his family business. They catered to the Indian Railways and Irrigation projects led by the GOI in its infrastructure development projects. This was the training ground and beginning of his remarkable relationships and networking skills across all strata of the society in India and across the borders and also with the Government authorities. In the late 90s, he ventured into the media sector that still continues to represent most of the top media houses for distribution of Pay TV / FTA channels for Star TV, Times Now and BBC. In early 2000, he further ventured into the business of real estate In which he is actively involved in the Slum Rehabilitation Authority Projects (SRA) in Mumbai and CIDCO projects in Navi Mumbai, India. 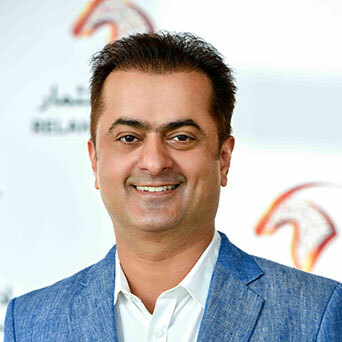 His latest venture is Dubai based company VSIS (Vault Smart IT Solutions). With this, he is his stepping foot into the IT sector globally. Hence all his business interests revolve around creating value in the given environment.